If you arent familiar with Maledia it's hardly surprising - these days the internet means there are so many bands competing for our attention that it's impossible to keep track of them all, and sometimes great bands like Maledia struggle to get noticed among the mediocre bands. Where the internet really does help though is getting a small band attention around the world. 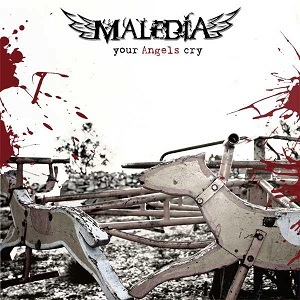 Maledia are an Italian Gothic metal band who date back to 2000 although they only released their debut album "She and her darkness" in 2010. Now two years later they have just released their second album - "Your angels cry" via UK based Ravenheart music - a label that's building a big reputation for itself among fans of female fronted bands with it's releases by a whole host of lesser-known but very talented bands. Despite being only seven songs, the album is still almost 40 minutes long so is still a decent duration. The opening song, "By the light of the moon" opens with powerful guitars and clean male vocals before the beautiful female operatic vocals kick in and take over. The song then alternates between the male and female vocals. There's lots of fast drumming and plenty of power from the guitars. "Fireflies" dispenses with the male vocals almost entirely and the female vocals have slightly less of an operatic feel - more of a Simone Simons sound, so more classical than truly operatic. The male vocals are more growly and are very sparingly used. It's a great song - probably my favourite song on the album. Hellrain starts with some lovely haunting vocals before the band kicks in with the main part of the song. This is an excellent album. If you like your gothic metal with female vocals then this is an album you really should get.